Jacksons of Hebden Bridge differed from most other suppliers in specialising in rugs made from thrums (loom waste from carpet weaving). Their printed canvases were designed to be used with the random colours found in bundles of thrums. Thrums are the unwoven ends of the warp threads in a loom; these remain attached to the loom when the web is cut off. The term also means any short piece of waste thread or yarn. Jacksons of Hebden Bridge remains a family busess, now into its 4th generation. 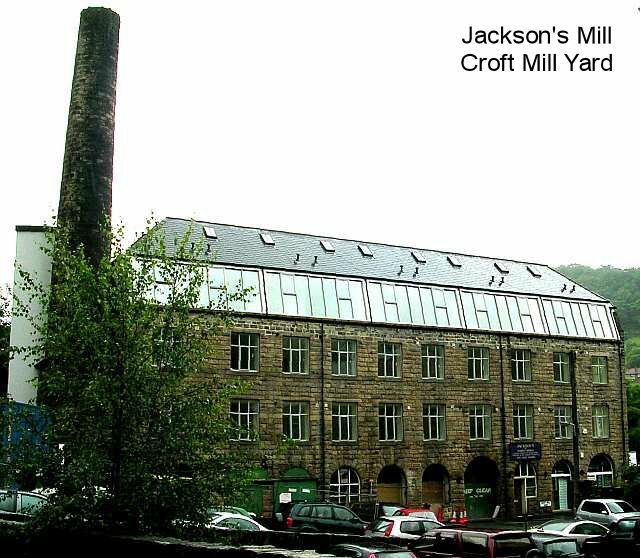 Jacksons Rug Craft Limited, of Croft Mill, Hebden Bridge, was founded on 17 Dec 1974 and dissolved in 2007. Its current incarnation, Jacksons of Hebden Bridge Ltd, was incorporated in 2003 and is the current form of a business that began in the 1930s. 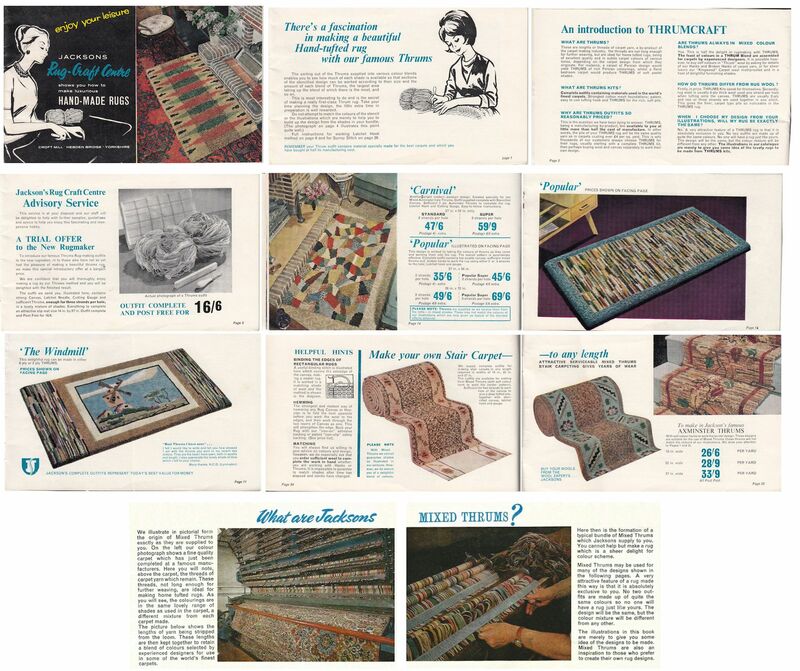 In the 1970s, they began producing kits for making tapestry church kneelers and pew runners. This became a very popular and niche enterprise and trades as churchkneelers.com. Over the years, Jacksons' tapestry kneeler kits evolved into the Brigantia Needlework Collection, known for their precision printing of canvases. Stoddarts of Halifax, described on a separate page, also sold canvases intended for use with thrums from the Axminster carpet industry. Kath Jackson, Brigantia Needlework, told “Craft Focus Magazine,” (April/May 2010 issue) what her company offered that others might not. She explained that about 70 years ago (from 2010), her father-in-law founded a haberdashery shop, Jacksons of Hebden Bridge, which produced rugmaking kits that used thrums as a sideline. Over the years, the rug making kits became so popular that they were the main earner for the business. The company now trades under the name of Brigantia Needlework and is known for its bespoke tapestry kits made to customer specifications and for patriotic tapestry kits and church kneelers. "In terms of the company’s size, there was never any huge growth,” explained Kath Jackson. “It was always a family business, but we expanded gradually just to keep up with the needs of customers. A Women’s Institute member once approached my father-in-law asking for a particular kit to be produced, and the demand evolved from there." "Thrums" was originally a northern British term for textile waste, for example the tail-ends of the warp thread left behind when a finished carpet was cut from the loom. A thrum was any short piece of waste thread or yarn, or a tuft or fringe of such pieces. These were collected together and sold by weight, making it an economical way of buying rug wool. Iriss of Penzance still do something very similar with their bargain bags of leftovers from the wool-cutting process. The thrums sold by Stoddarts of Halifax came from the Axminster carpet industry. Although there would be enough yarn, sold by weight, for a rug, the colours in each bargain package depended on the pattern of the carpet they had come from. You could either make a random coloured rug ("Scrambled Egg" pattern as Stoddarts called it) or buy a printed canvas designed to be used with thrums. With the pre-printed canvas you didn't match the yarn colours to the canvas colours, but instead worked the pattern according to how much you had of each colour yarn. Unless you were making a random coloured rug, the first task was to sort the thrums by colour. For most of us, this meant e.g. blues, greens, reds rather than into exact shades. These then had to be cut to the desired length. The thrums were used 2 or more to a hole and Stoddarts suggested blending colours to make the best use of the threads. 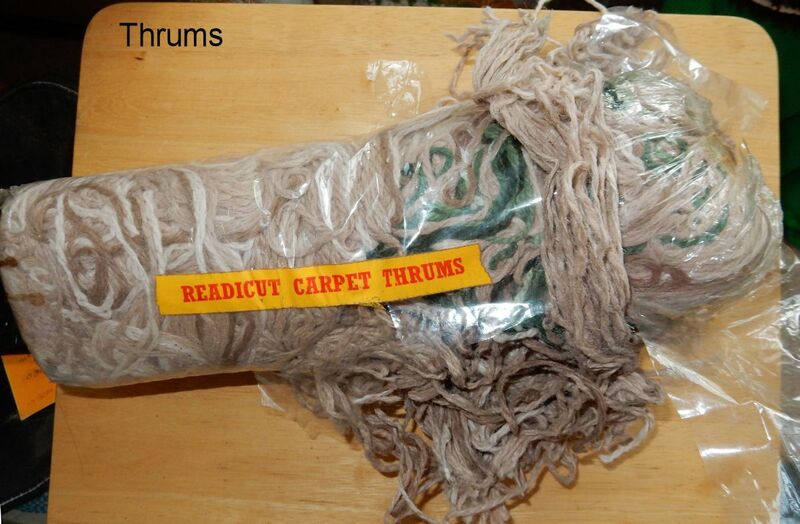 Because thrum means a tuft of yarn, some folks refer to all pre-cut rug-yarn as thrums, especially if it's bought in a mixed bag of leftovers, which isn't strictly correct as the thrums in this case would be the varying lengths of yarn left over from the cutting process! The use of thrums in latch-hooking goes back to when Workers in weaving mills were allowed to collect waste pieces of yarn (up to 9 inches long) that were useless to the mill. The weavers took these home and pulled the thrums through burlap or hessian sacking to make rugs. The two rug supply companies that sold thrums, along with tips on how to use them, were Jacksons of Hebden Bridge and Stoddarts of Halifax. Jacksons is still in the needlecraft business, but Stoddarts has vanished. There's a Scottish folksong "The Three Threads" that goes "Hirple, dirple, dirrum dum, Three threads and a thrum," where the refrain is supposedly what a cat is saying as it purrs. The term itself seems to come from the Old English word for a ligament (a sinewy fibre), via the Middle English "throm" meaning an endpiece. The Old English "thrum" is related to the Old High German "drum" and the Dutch "dreum" meaning a remnant, which may be related to the Old Norse "thromr"meaning a brim or edge.